Most kayaks are unable to take on the challenging waves of the ocean. You wouldn’t want to even attempt the crashing waves that you can find on the shore. If, however, you’ve got a protected inlet where you can get out onto the salty waters of the sea, then this Salty Dog has some tips for you to have a beautiful day on the ocean waters. The best kayak for ocean navigation needs to have a few specific features and qualities to it for a good experience. Here are the best of the best products that have been made right now. What Is the Advantage of the Best Ocean Kayak? The best advantage that comes with an ocean kayak is that they are very easy to paddle and quick to forgive. Remember to relax while you are paddling. A death grip on your paddles isn’t going to move your kayak any faster or slower. Make sure you are sitting with a good posture, having your knees slightly bent, but no too far so that you bang your knees together as you are paddling. The one place where there is no forgiveness with the best ocean kayak, however, is the offshore breezes that can develop in the sea. If these winds fire up, and they will, it will make it difficult to return to shore. Always be aware of the weather, make sure you’re dressed for it with the right kayaking gear, and make sure someone knows where you plan on paddling. The focus of ocean kayaking is usually on posture and paddling [or the fact that you need to bring water with you], but the Wet Release is also an important skill to know – and practice. Anything can happen when you’re in a kayak on the ocean. If you flip over and find yourself underwater, it can be scary if you don’t know what to do. Make sure you lean forward as the first thing you do. Push the bottom of your kayak with your paddle. Release the spray skirt that has you affixed to the kayak so that you are no longer constrained. Take a moment to make sure that the skirt has been completely removed and then get out of the boat. If you’ve never flipped over in a kayak before, then being in the cold, salty ocean is enough to even give this Salty Dog a few shivers. You don’t mess with the power of the ocean. You respect it. With that being said, if you’re wearing the REQUIRED life vest, then you’ll propel out of the boat and float to the surface pretty quickly. What Are the Prices of the Best Ocean Kayaks? The best ocean kayaks tend to be a little more expensive then the other types of kayaks that are available today. This is because they need to be more reinforced and made from better materials to stand up to the ocean environment. For that reason, you’ll find that most kayaks built for the ocean are priced in the $1,000 range. What Are the Salty Dog’s Favorite Ocean Kayaks? If you like the idea of a sit-on-top design and you’re looking for something that is fairly basic, then this could be the best ocean kayak for you. It’s got some foam for the seat so that you don’t get cramps and lower back pain from a long day of paddling. There are also overlapping foot wells included in the design that are nice because they accommodate virtually any leg length. The 6-inch Cam Lock hatch helps for dry storage items as well. All in all, this is a pretty good investment. If you’ve got some calm waters and want to do some close to shore ocean fishing, then this beautiful kayak will help you get that done for a pretty amazing price. It’s a little less than 10 feet long, but this adds to the stability of the boat. There is interior foot bracing and back supports that are both adjustable so that users can get a true customized fit. Two flush mount fishing rod holders round out the advantages – and you can’t forget about the third swivel rod holder. 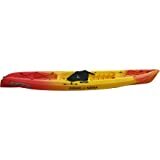 Made with a heavy-duty nylon cover and a PVC bottom, this sit-on-top kayak isn’t going to handle the waves along the shore, but it will help you get out onto the calm waters of an interior sound pretty effectively. The gliding of this boat is what really makes it stand out, but this is a custom kayak, so don’t order it today and expect to get it tomorrow. On the other hand, you’ll have a kayak for calm ocean waves made especially for you – and it weighs just 19.5 pounds. If there’s a little chop out on the water, a lot of ocean kayaks are going to force you to stay home. Don’t be fooled by the fact that this kayak is inflatable – it is strong. It’s got strong supports within the seating environment, which can fit two people, and there are aluminum ribs within the bow that help to define the shape of the boat and give it a little extra stability. 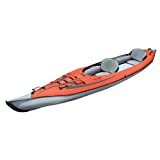 There are also three seating locations so you can use this boat as a solo kayak without needing to supply a ton of extra weight to make it useable. This ocean kayak was built for turning and tracking. It’s 10 feet long, just 30 inches weight, and weighs 40 pounds with a sit-in design. The seat is adjustable and comfortable and the high back support helps to relieve some discomfort. The shock cord rigging isn’t the best it could be, but there are adjustable foot braces and a spray deflector collar that will help create a better overall kayaking experience. Getting out into the ocean with a kayak might seem intimidating, but it doesn’t have to be. When you’ve got the best ocean kayak providing you with a great experience, you’ll be able to have a safe paddling experience that could just create one of the best days you’ve ever had.